Alaska, Blackwater, Ginebra, and TNT all came up big winners this past week in the 2016-2017 PBA Philippine Cup! The Blackwater Elite shook off their recent slump as they got back on the winning track with a victory over the NLEX Road Warriors, 96-85, in the Oppo PBA Philippine Cup on Wednesday at the SMART-Araneta Coliseum. Arthur Dela Cruz led Blackwater with 18 points and eight rebounds while Kyle Pascual added 16 points on 8-for-10 shooting from the field. Ronjay Buenafe added 13 markers while JR Sena chipped in with 11 as they proved they could get the job done despite a subpar showing from their super rookie Mac Belo, who logged just nine points alongside five rebounds and five assists. It was the Blackwater franchise’s first-ever win over NLEX and was enough to stop a two-game losing skid for the Elite after their promising start to their conference. They are now 3-2 in the standings while the Road Warriors slipped down to 1-3 after a third straight defeat. Arthur Dela Cruz (BLA) - 18pts, 8rebs, 1ast, 1stl. Carlo Lastimosa (NLX) - 23pts, 1reb, 1ast, 1 triple. The Alaska Aces hit several three-pointers in the clutch as they stormed back from 10 points down in the fourth quarter to stun the Meralco Bolts, 81-79, in a crazy Oppo PBA Philippine Cup finish on Wednesday at the SMART-Araneta Coliseum. JVee Casio, RJ Jazul and Chris Banchero all hit triples inside the last two minutes as the Aces pulled the rug right from under the Bolts in the endgame. Vic Manuel starred for Alaska, tallying team-highs of 22 points and 10 rebounds. Calvin Abueva added nine points, severn rebounds, five assists and two blocks, including a crucial one in the final minute. Two other Aces – Banchero and Jaypee Mendoza – also finished with nine apiece. 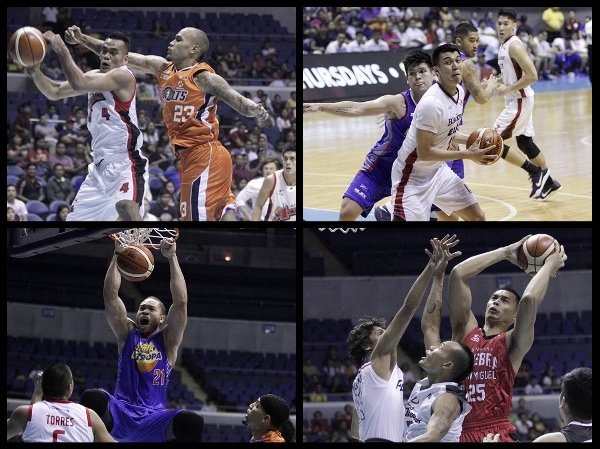 With the come-from-behind win, Alaska forged a five-way tie with Meralco and several other teams at 2-2. They also snapped the Bolts’ two-game winning steak. Vic Manuel (ALA) - 22pts, 10rebs, 3asts, 2blks, 1stl. Chris Newsome (MER) - 23pts, 8rebs, 5asts, 1stl. The TNT KaTropa turned in a dominant performance as they cruised to a blowout win over Phoenix, 117-98, to bounce back in the Oppo PBA Philippine Cup on Friday at the SMART-Araneta Coliseum. Kelly Williams posted a double-double of 18 points and 10 rebounds while Jayson Castro also finished with 18 as TNT, which was coming off a loss to Meralco, moved back up the conference standings with a 3-2 record. Williams shot 8-for-11 from the field in under 20 minutes of playing time in a strong performance. Castro, meanwhile, finished with four assists to go with his point total. Troy Rosario also had a solid showing with 17 points and nine rebounds. Kris Rosales added 14 markers while Mo Tautuaa chipped in with 11. Phoenix, which dropped to 2-3, was led by Mark Borboran’s 18 points and Matthew Wright’s 17. Kelly Williams (TNT) - 18pts, 10rebs, 1ast, 1stl. Mark Borboran (PHX) - 18pts, 6rebs, 2stls, 4 triples. Japeth Aguilar scored 15 points and grabbed 12 rebounds, and Barangay Ginebra found its groove in the second half to crush Mahindra, 89-70, in the PBA Philippine Cup at the Araneta Coliseum on Friday. Both teams were sloppy in the first half, which ended with Ginebra ahead 32-27. Ginebra got some separation in the third quarter, before stepping up in the fourth for its second win in four games. Ginebra’s young players stepped up, including Kevin Ferrer, who scored 12 points, the same output as veteran Chris Ellis. Ferrer, a former University of Santo Tomas Tiger also tallied three boards, one assist and a block. Mark Yee paced Mahindra with 15 points. Nico Salva was the only other Floodbuster who scored in double digits with 11. Mahindra remains winless in five games. Japeth Aguilar (GIN) - 15pts, 12rebs, 2asts, 2blks. Mark Yee (MAH) - 15pts, 8rebs, 1ast, 1stl, 2blks.